Children with pervasive developmental disorders often do not learn from conventional methods, which can result in social isolation, behavior problems, limitations in communication, and slow academic growth. Greater integration into home and school activities, improved behavior and academic success can be achieved using alternative-augmentative communication (AAC), and this book explains exactly how to make it happen. 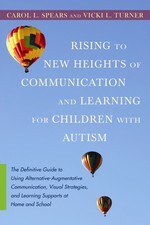 Exploring the various communication and intervention options available and offering straightforward techniques and strategies for using them effectively, this book clearly explains everything families, teachers, therapists and other professionals need to know in order to improve a child's communication, behavior, social and academic skills. Chapters follow a consistent, user-friendly format, answering the questions Who, What, Why, How, Where and When about every technique. This book will be essential reading for anyone looking to improve social interaction between children with pervasive developmental disorders and those around them. - Tizard Learning Disability Review. Introduction. Part 1: Alternative-Augmentative Communication Methods. Chapter 1. Speech Generating Devices (SGD). Chapter 2. Picture Exchange Communication System (PECS). Chapter 3. Symbolic Language Systems. Part 2: Strategies to Support Learning. Chapter 4. Visual Supports. Chapter 5. Social Stories. Chapter 6. Structured Environments. Part 3: Resources. Chapter 7. Information on Related Topics. Appendix 1: National Organizations. Appendix 2: Goals and Objectives.